Thank you for the October 26 newsletter with the great “Falling For Jesus” tree idea! As a technology teacher in a parochial school setting, I am always on the lookout for ways to incorporate faith into my lesson plans. I was getting ready to introduce “Tagxedo” word clouds to my students for later use in the classroom, so we made a Falling for Jesus tree of our own. 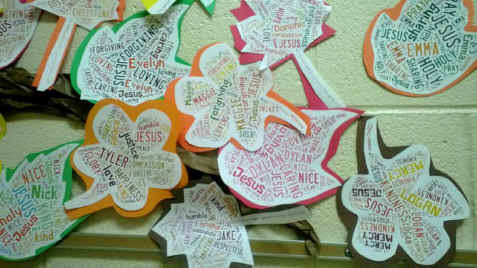 The students created word clouds in the shape of a leaf. Each text included the students name, Jesus name, and a number of words they associate with what Jesus has taught us; for example, sharing, love, hope, prayer. We did this with grades 2, 3, and 4 using grade level appropriate words – the 4th graders came up with “compassion” and “empathy”! After students printed their leaves, I cut and pasted each one, then created a large tree in the hallway. It gave us a chance to discuss Jesus in computer class and the students loved finding and comparing their leaves.